Major Japanese companies are suffering from the fallout from the deadly earthquakes that have hit the country in recent days. Toyota (TM), the world's largest automaker by sales, is one of the hardest hit among the big corporations. The company said it's experiencing a parts shortage as a result of the quakes and is suspending production on a number of its vehicle assembly lines across Japan this week. Toyota shares tumbled 4.8% on Monday, helping drag down the benchmark Nikkei by 3.4%. A series of earthquakes shook the southern Japanese island of Kyushu, a major auto manufacturing hub. 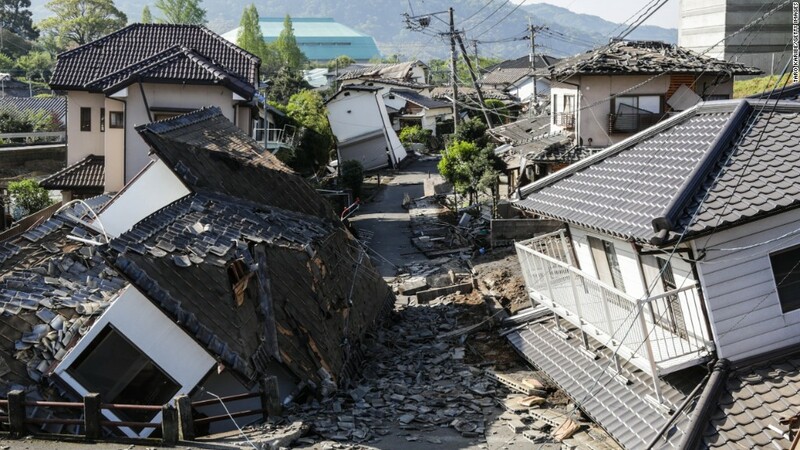 The two strongest quakes hit on Thursday and Saturday, killing dozens of people and damaging thousands of buildings. Other large automakers also reported problems in the aftermath of the disasters. Honda (HMC) has halted operations at a motorcycle factory in Kumamoto, the city where the most powerful earthquake struck. The plant, which usually churns out 750 bikes a day, will remain shuttered until at least Friday, when the company says it will make a decision on whether to reopen it. Two Nissan (NSANF) factories also sustained some damage. The company said that the plants have reopened, but that it's too early to say when they will return to full capacity. Beyond the auto industry, the technology company Sony (SNE) said it stopped operations at a manufacturing facility in Kumamoto that makes semiconductors and image sensors. The company is still surveying the damage to determine when the plant can resume normal operations, but aftershocks in the area continue. Some production at two other Sony facilities was temporarily halted and then restarted on Sunday. Despite the disruption, analysts say the effects of the quakes on Japanese industry are unlikely to be protracted. "The scale of damage does not appear huge, and production shutdowns by major manufacturers should be reversed before long," Marcel Thieliant of Capital Economics wrote in a research note. --Rebecca Wright and Andrew Stevens contributed to this report.